Part confessional, part thriller, Elke Schmitter’s explosive first novel is the story of Margaret. 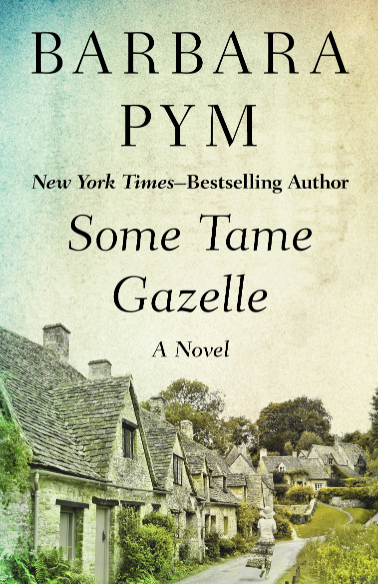 Jilted by a rich boyfriend when only eighteen, she finds herself many years later married, with a daughter, to Ernst, a war veteran with a penchant for routine and order. Living out her days in a small German village she is emotionally frozen, until one day she embarks on passionate affair with a married man. Planning to run away with him, she seems unaware that her plan is a fantasy that can never come true, and similarly unaware of the shocking repercussions that could result from chasing such a dream. Why does someone commit a crime? Especially someone who isn’t really a criminal, but an ordinary person. 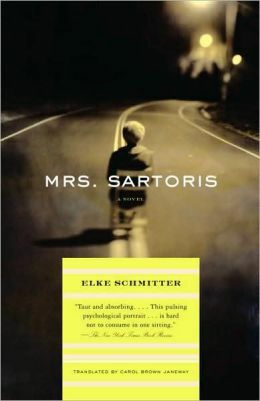 Mrs Sartoris is an ordinary person, still, she kills someone. How that happened and who she killed is at the heart of this captivating and masterful novel. Mrs Sartoris is a troubled woman. 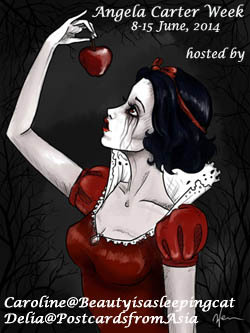 She drinks too much, is unhappy and once upon a time she spent a few months in a psychiatric hospital. She lives with her mother-in-law, her husband and her daughter in a small house. The only person in her life she’s truly attached to is her mother-in-law. She makes life bearable. There is no warmth between her and her husband and, as we will learn later, there are reasons for that. The book opens with a cryptic short paragraph in which Mrs Sartoris, who tells the whole story, writes about an incident. What it is will be revealed very slowly. Small chapters on that incident change with chapters on her life. Her childhood and unhappy love story, her dreadfully boring and conventional married life, her affair with Michael. Mrs Sartoris isn’t an entirely unreliable narrator but she’s highly deranged and depressed which clouds her judgement. The story as such is interesting and suspenseful. And there is a twist at the end, which is very well done. But what makes this book truly masterful is the way it’s told. There are passages in the narration that I would call “litanies” in which Mrs Sartoris enumerates things. In one instance she talks about all the meaningless sentences she doesn’t want to say anymore. Reading them in rapid succession is eerie to say the least and makes the reader think how often one uses empty phrases just like that. How many meaningful conversations do we have day in and out? Another litany enumerates all the things Mrs Sartoris has never had in her life and this reveals so much bleak emptiness, it’s chilling. Mrs Sartoris has been compared to Mme Bovary. I don’t think I would have made the comparison if the blurb hadn’t told me to make it. Sure, there is an adultery, but other than that? Mrs Sartoris’ husband is as conventionally boring as Charles Bovary, Mrs Sartoris is lost in a dream world and her lover resembles Mme Bovary’s lover a tiny bit but that’s that. I would, if I had to, much rather compare it to Tim Parks’ Loving Roger. Mrs Sartoris is the tightly woven story of a life, an analysis of a crime written in a chilling, and revealing style that will haunt readers for quite a while. For another take on the novel here is Stu’s review. This one sounds like something I would really love. I actually don’t like it when blurbs compare a work to a known work. Always sets me up for a disappointment. It’s mostly a disappointment and it’s not the books fault. In this case the compariosn doesn’t really bring much. I think you’d like it. Good questions about non criminals committing crimes. I think that tales of such folks are more interesting then stories about people who are wantonly evil. They grey area is fascinating, those tales which make us wonder “What would I have done?”. This is another book I’ve had on my to read pile for a long time, always intending to read it so I’ve never got rid of it when I’ve had a cull, but I’ve never yet had a good go at reading it yet, either. Seeing it here and Stu’s blog has reminded me that I should certainly try it. Lovely review. It’s a very quick read, Lindsay, just try a few pages and you know right away whether you’d like it or not. the tone is consistet throughout. I hope you’ll like it. I’d be interested to read your thoughts. What Mrs.Sartoris says on meaningless sentences and your thoughts on that made me think. That is very true, how many meaningless sentences and words we use everyday. It made me think of a passage I read in the Ingeborg Bachmann story ‘A Wildermuth’ in which the narrator talks about how we use broad words to describe people and things, while the truth is that reality is a combination of infinite tiny moments and people live in those moments and exhibit different qualities and think different thoughts in every different moment and how it is impossible to generalize and describe a person using a few broad adjectives. I can’t wait to read this part of Elke Schmitter’s book. Thanks, Vishy. I’m sorry I made you order another book. 🙂 I found those “litanies” amazing. When you read all of those sentneces one after the other it’s quite sobering. I know I try not to use tired phrases but it can happen and it’s a bit sad. I need to re-read Bachmann. I think sometimes were in a frame of mind in which we don’t see all the tiny moments anymore, but just one blob. That’s how Mrs Sartoris experiences things. I hope you will like it. It’s hard to choose between this and Rain, I’d say. I am glad you inspired me to order Elke Schmitter’s book, Caroline 🙂 I can’t wait to read it. I just started reading ‘Rain’ and I am loving it. Nice to know about the ‘litanies’. I can’t wait to read Schmitter’s book, just for this part. I am getting a feeling that I might like Mrs.Sartoris, inspite of her killing someone. I liked very much what you said about how we sometimes are not able to see the tiny moments anymore. So beautifully put. I’m so curious to find out how you will like the character – and the book of course. I can’t wait to read your review of “Rain”. I’m glad you like it so far. Thanks Caroline: I bought this after you mentioned it in an earlier post. I read and really enjoyed Loving Roger, so I know I’ll enjoy this too. I’m very intersted to hear your thoughts. I thought it had some really great passages. I probably won’t read it for GLM as I already have my choices maxed out for the event. I thought so. I’ll be still interested later. I love characters like this–much more interesting to read about an “ordinary” person who goes wrong than a hardened criminal. Moral ambiguity fascinates me no end. Great review, Caroline. Thanks, Carole. I think that’s why this was never labelled a crime story because it’s about one person’s life and the crim isn’t the most important aspect anyway. I hadn’t heard of this book before and it sounds very interesting, so I’ll add it to the “to be read” list :). The premise – what makes a “non-criminal” commit a crime – is fascinating and I very much enjoyed the last novel I read that dealt with the topic, Ferdinand von Schirach’s “The Collini Case”. The character’s background is probably very different, but I like the parallel in the premise. I hadn’t thought of von Schirach as the approach of this book is very different but that’s what his stories are all about. Only the crime is far more importnat than it is here. I hope you’ll like it. You’re welcome. Yes that is surprising. I’m not sure the Mme Bovary comparison was in its favour. I usually read a crime novel for the GLM but I didn’t choose one this year–I will look for this, however, for later. I like psychological crime novels–it sounds like something Ruth Rendell might have written. I’m not sure I like it when one book is compared to another like that–I suppose it is a way of selling a book? I think they wanted to either praise it a great deal or sell more in comparing it. I’m quite sure you’d like her. She reminded me of Ingrid Noll. It was never marketed as a crime novel, which is odd because that’s to a large extent what it is. I would have liked to read it for GLM. It doesn’t remind me of Madame Bovary (although the French publisher also mentions it in the blurb) but more of a toxic relationship like in Thérèse Desqueyroux. What do you think? Yes, absolutely, i think I even thought of her briefly. It’s different but the mood is more like that. I hope you’ll read it some day.